STAY MORE ACTIVE FEEL MORE ENERGETIC. EXERCISE DISCRETELY. A premium elliptical under desk machine, designed for use while sitting to optimise exercise for those long days at the office. A compact, ergonomically designed, and quality made product that will fit seamlessly into the interiors of any space, motivating you to stay active by optimising posture and leg movement. By connecting health with technology you will feel part of the connected fitness ecosystem. Designed to be whisper quiet so as not to disturb those around you. The Cubii is NEAT® Certified by the Mayo Clinic. 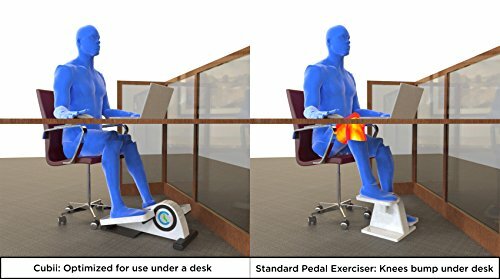 This below-desk elliptical improves sedentary workplace environments by encouraging leg movement while sitting. 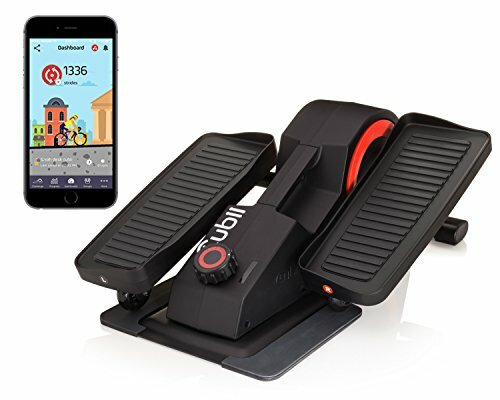 This premium under desk machine is the only seated elliptical that is connected to our mobile app and Fitbit. Proud winner of the 2016 Good Design Award, the Chicago Athenaeum Museum of Architecture and Design and Metropolitan Arts Press Ltd. When compared to stationary sitting, Cubii increases your energy expenditure by 84.5% while standing only increases your energy expenditure by 16.7%. Because of this increase in energy expenditure, Cubii passes NEAT® Certification criteria for active sitting developed by Mayo Clinic. Ensure you keep 2-3 inches between your knees and desk so you don’t bump your knees on your work surface. Start building your body strength today!